FitnessGram was developed more than 20 years ago by The Cooper Institute to enable physical educators to facilitate communicating fitness testing results to students and to parents. FitnessGram helps achieve goals by applying easy-to-use technology to conduct fair and accurate fitness assessments and easily record the results, set individualized goals for students, give students responsibility for managing and recording their own activities, create detailed reports of progress and results for students, parents, and administrators help students and parents understand the value of physical activity. Although the program is designed to assess the fitness levels of children in grades K-12, the program is also appropriate for use with young adults up to age 30. FitnessGram assesses three general components of health-related physical fitness, which have been identified as important to overall health and function. The components are listed below, with links to general descriptions of these tests if available. Many test items offer multiple options to choose from. One-Mile Run — complete one mile in the fastest possible time, either walking or running. Curl Up — Abdominal strength and endurance test. Trunk Lift — Trunk extensor strength, flexibility and endurance. Each score is evaluated against criterion-referenced standards, called Healthy Fitness Zones, that have been established to indicate levels of fitness corresponding with health. Standards have been set for boys and for girls based on age, based on what is optimal for good health. The use of health-related criteria helps to minimize comparisons between children and to emphasize personal fitness for health rather than goals based solely on performance. Since only modest amounts of exercise are needed for obtaining health benefits, most students who participate in physical activity almost every day will be able to achieve a score that will place them in the Healthy Fitness Zone. 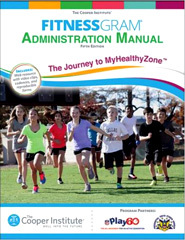 Reports are available for each student, and a special version for parents, that recommends physical activity program options to help students make it into the Healthy Fitness Zones for those areas where they need improvement. Plus, the reports explain in non-technical terms why physical activity is important and how regular physical activity leads to improved health and fitness. The FitnessGram report is a tangible reminder of what students learn in class and a great way to enlist parents' support in their children's physical activity programs. Now, in its newest release, FitnessGram 8.0 includes expanded features that make it more versatile and more convenient than ever before. It has a centralized database which is especially convenient for large schools or districts that need to track students and compare their test scores over time as those students move through the school system. 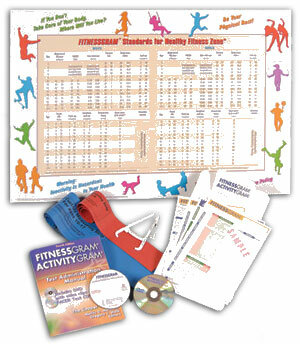 Buy FitnessGram / ActivityGram Products - including the Test Manual, PACER cd, skinfold calipers, software and report forms. buying the PACER audio cd - this recording provides pacing for the shuttle run portion of the test as well as cadences for the curl-up and push-up tests. information about buying the Measuring Strips for use with the curl up test (or make your own). poll: What age is appropriate to start fitness testing children? more about Fitness Testing Children.